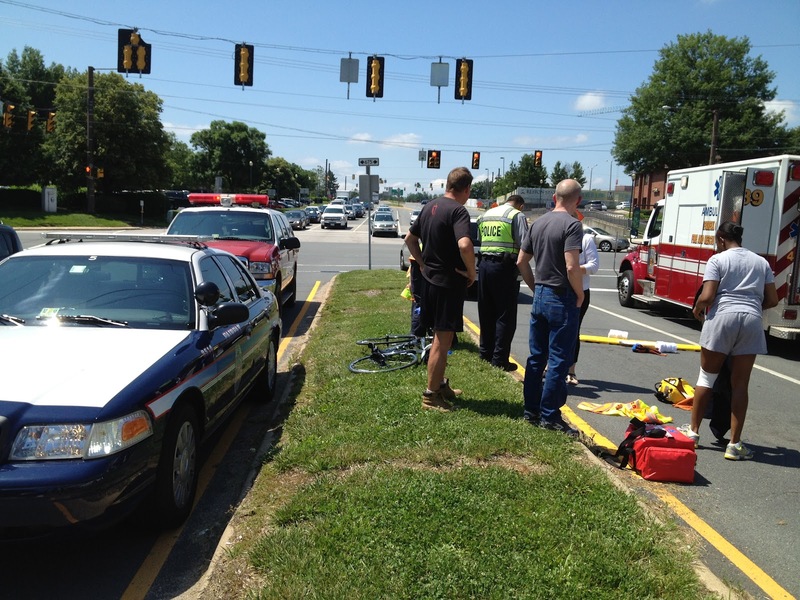 One of the most dangerous road crossings on the W&OD Trail is at Wiehle Ave. Today a bicyclist in the crosswalk was struck by a motorist. The bicyclist was taken to the hospital. The motorist's windshield was smashed and the carbon road bike was likely totaled. It appears that the crash occurred in the southbound left turn lane. Often there is a line of motorists stopped at the crosswalk and cyclists headed eastbound start to cross. The left turn signal changes first and often motorists speed to catch the light. I believe there have been several bike/car crashes in this lane. Cyclists need to remember to cross one lane at a time, and obviously motorists at this location should always be on the lookout for bicyclists, especially when there's a line of cars stopped at the crosswalk. If we hear more about the condition of the cyclist we'll pass it on. I used to work 25 yards from there, and while I might counter that the Sterling Blvd. and Belmont Ridge Rd. crossings are worse, this one is pretty bad. The worst part of it is not the left-turn lane, but rather the lack of a "rescue island" between the north- and south-bound traffic. There's almost enough room for one bike, if you turn to a 45-degree angle. Yeah, that stinks. I live in the area and frequently bike and walk W&OD. Many cyclists treat the trail as their personal time trial course, not stopping or looking at the crossings--especially at Buckthorn. Common sense dictates that cyclists will come out worse with a collision with a vehicle. Be careful and sensible! I had an accident here 6 years ago, fortunately for me i came out with 3 stiches to up my upper eye. Seriously, motorist needs to be more careful and also cyclist should be on the defensive. There's a lot of impatient rich people with their rich kids in our area that does not care if they hit you. Thanks for the very important safety reminder about crossing Wiehle Avenue. That is a difficult crossing for cyclists and for peds, too. I always try to make definite eye contact with drivers. And I always hope for a definite "I see you and I'm letting you go" gesture, which is a 50-50 proposition and usually from someone with a "share the road" sticker or a bike rack affixed. Please update on the condition of the cyclist when you have more information. I was almost hit at the same spot by a Pizza delivery car. Traffic was stopped for the red light. I crossed the first 2 lanes of traffic going East then looked before starting across the left turn lane to the center of the road. Even though the light was red, the Pizza car driver was really moving (maybe so he could trip the left turn signal before the light changed). He saw me and slammed on his brakes, but it wouldn't have made any difference if I hadn't stopped first and looked left. It is a terrible intersection for crossing. I work near there, and I'm tired of bike riders blowing through the stop signs on the trail. Bike riders are not pedestrians: you're vehicles, and you have to obey the traffic rules other vehicles do. "A review of the Code of Virginia should be undertaken with respect to those sections dealing with trail users on multiuse pathways and their obligation to comply with non-signalized traffic control devices. The purpose of the review should be to determine if legislative changes could help alleviate the confusion about right-of-way, and if so, to suggest appropriate legislative change proposals. Such a review could be initiated, or led, by VDOT’s Traffic Engineering Division with assistance from staff at VTRC. A cursory review of the Code language in this study suggested that trail users on multiuse pathways may not be obligated to comply with non-signalized traffic control devices where the trail intersects a roadway. In addition, the research found there is confusion among motorists and trail users about right-of-way laws regarding the W&OD Trail where a STOP sign is directed toward the trail users. This confusion could compromise safety at these and other similar multiuse trail/roadway intersections." Same thing happened to me 23 years ago. Luckily i wear a helmet and thoughi grazed a corner of the windshield, i was okay. Landed hard in the road and had a badly bruised hip. I thank goodness it was me, though, and not the couple of riders in front of me who were helmet-less. One of them would have been history. It's odd the just as Reston has added nice cycle routes to the roads and made the roads safer it seems that people driving both North and South across the W&OD crossing get more selfish, thoughtless and stupid. The "do not block area" outside the fire station is routinely chock full of morans. People coming out of the fast food grease pits heading north make illegal turns in the emergency vehicle cut through and speed up for the lights. I have had to jump out of the way a few times so now I carry a few rocks to attract attention when I walk across and if anyone toots or aims for me or is just plain stupid they may get a new wind shield. This are needs to re-marked and more regularly policed.